Most people who know of Abraham Abraham do so because of his brief partnership with the well-known microphotographer and microscope-maker John Benjamin Dancer. But microscopes, slides, and other scientific apparatus with Abraham’s name appear with some frequency at auction and in collections. He operated a long-standing scientific and optical supply business in Liverpool, England, under his own name, and in Liverpool, Manchester, and Glasgow, with several partners. One of those partners continued to use Abraham’s name after the latter’s death, well into the 20th century. 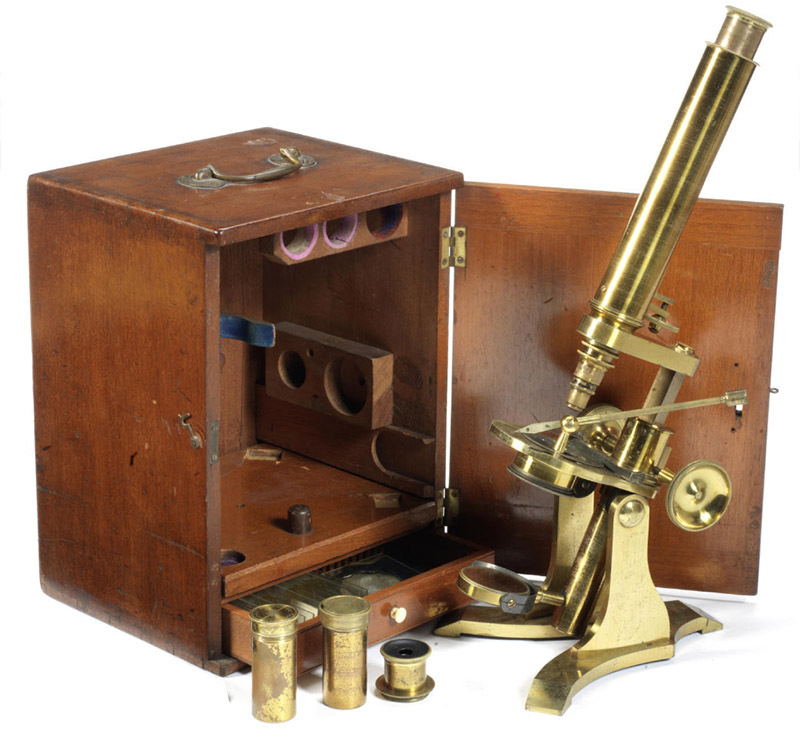 The microscopes and other instruments made by Abraham (and partners) are generally of very good quality, and the slides they sold were brought in from some of the top preparers in England and France. 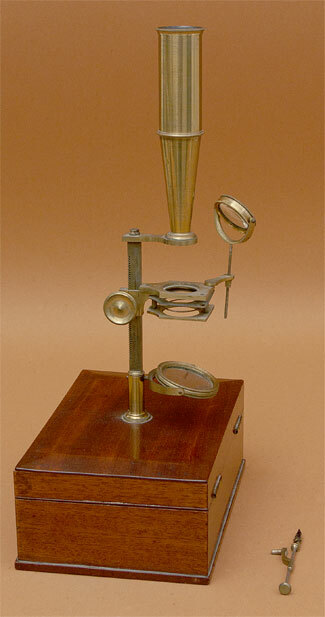 Additionally, Abraham was a market leader in the production and retail of inexpensive achromatic microscopes. Briefly, Abraham was the son of Jacob Abraham, an optician and scientific equipment supplier in Bath, Somerset. Abraham Abraham moved to Liverpool and opened an optician/scientific business in 1817. In 1838, he formed a partnership with Simon Phineas Cohen, of Glasgow, to open a branch in that city. The Glasgow “A. Abraham and Company” partnership lasted until 1843. In 1841, Abraham and Liverpool optician John Benjamin Dancer jointly opened a shop in Manchester, as “Abraham and Dancer”. That lasted until 1844, with Dancer continuing the Manchester location under his own name. During both of those partnerships, Abraham maintained the Liverpool shop as, simply, “A. Abraham”. Abraham formed a Liverpool-based partnership about 1849 with his long-time manager Charles West and optician George Wood, as “A. Abraham and Company”. Abraham appears to have been a silent partner in this operation, as he retired to Somerset shortly afterward. The partnership ended in 1855, with Wood continuing at the original Abraham location, and West opening a new shop down the road. Wood, and his successors, maintained the “Abraham and Co.” name until the late 1800s, later adopting the name of “Wood-Abraham”. A more detailed description of the lives, associations, and productions of Abraham, West, Wood, and Cohen may be read below. Figure 1. Microscope slides retailed by Abraham Abraham and associates. A. 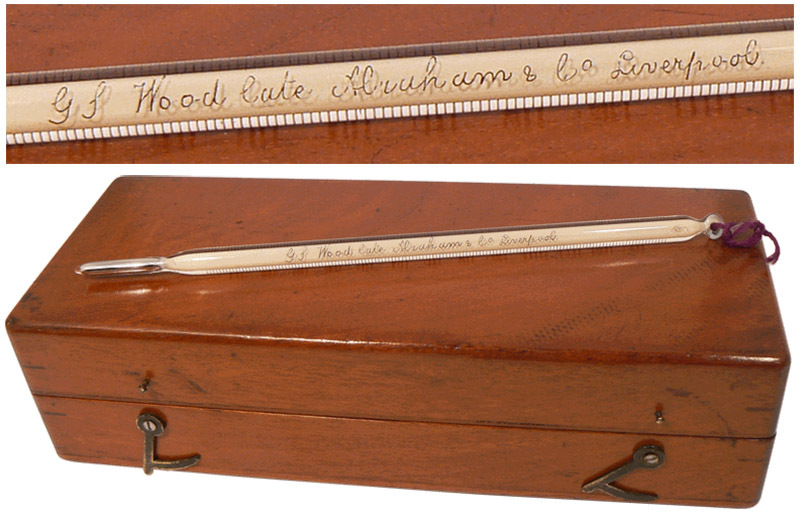 These slides with from A. Abraham and Co. were sold either during 1851-56 partnership between Abraham, Charles West, and George Wood, or when Wood later operated alone under that name. The illustrated slides were prepared by professional preparers John T. Norman (left two) and Joseph Bourgogne (third from the left). Bracegirdle’s ‘Microscopical Mounts and Mounters’, plate 3, shows two additional slides with Abraham and Co. secondary labels, one of which was also made by Bourgogne. B. A smaller, "continental" slide, unsigned, but recognizable as also being the work of Joseph Bourgogne. Bracegirdle plate 3 also includes pictures of two small slides by Joseph Bourgogne and with labels from the partnership of Abraham and Dancer (1841-1844). Figure 2. 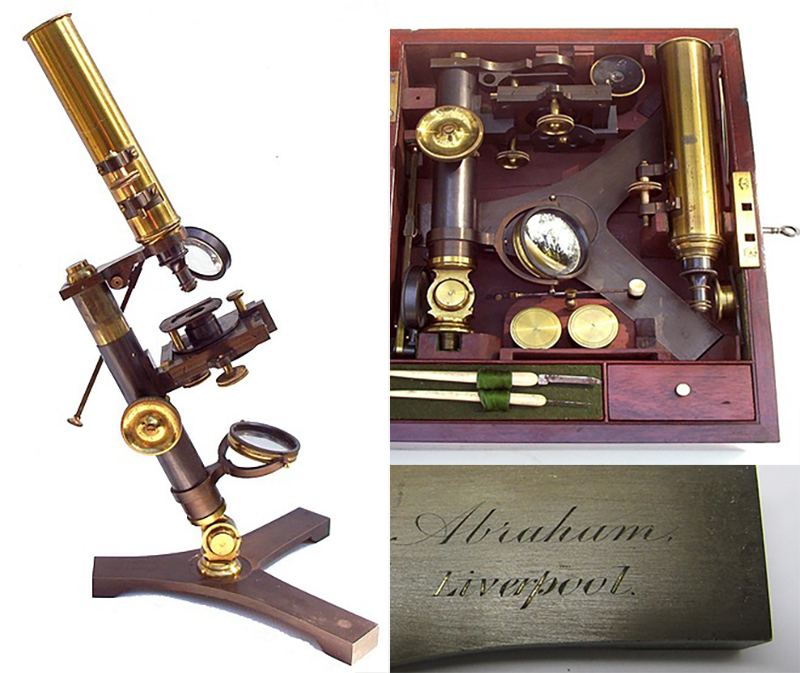 A case-mounted (“Gould-type”) microscope, engraved on the stem “Abraham, Liverpool”. He operated a business under that name between 1817 and 1848. Image adapted for nonprofit, educational purposes from the Golub Collection, http://golubcollection.berkeley.edu/19th/40.html. Figure 3. A microscope signed “Abraham, Liverpool” on the foot. Images adapted from an internet auction site, for nonprofit, educational purposes. Figure 6. 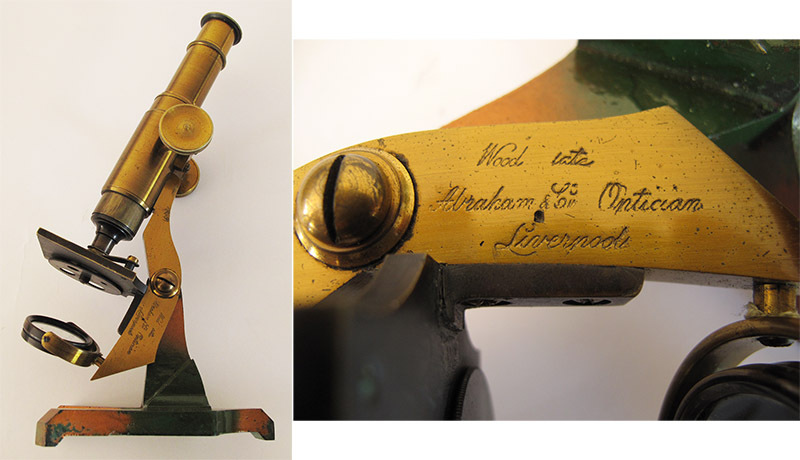 A microscope signed by Abraham. The pattern appears to be unique, suggesting that it was designed and made by him.. Figure 7. 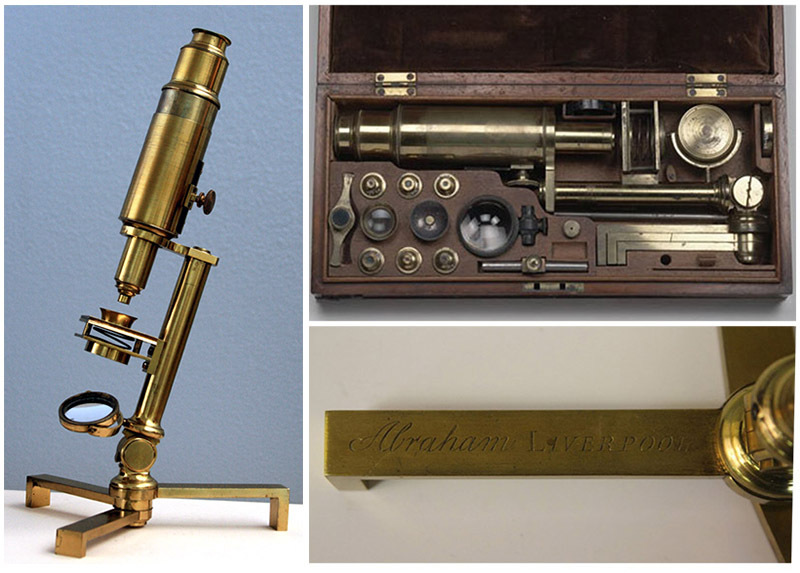 Another microscope signed by Abraham. Similar instruments are also known that were signed by signed Carpenter & Westley, London, and James Robinson, Dublin. Images adapted, by permission, from http://www.antique-microscopes.com/photos/abraham.htm . Figure 8. Microscope retailed by Abraham and Dancer, 1841-1844. 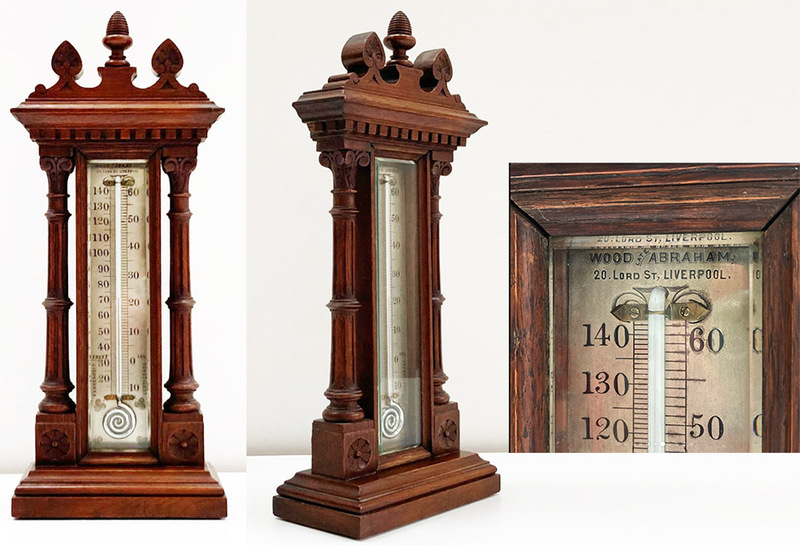 Adapted for nonprofit, educational purposes from The Museum for the History of Science. Figure . 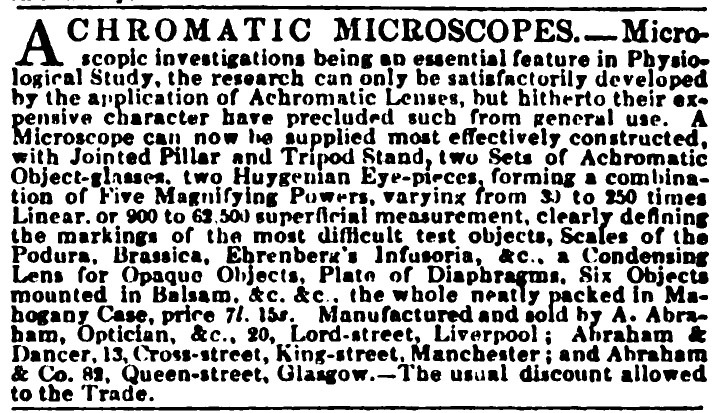 An 1841 Advertisement for inexpensive achromatic microscopes, by Abraham Abraham. The description matches the microscopes shown above in Figures 6 and 7. Figure 10. 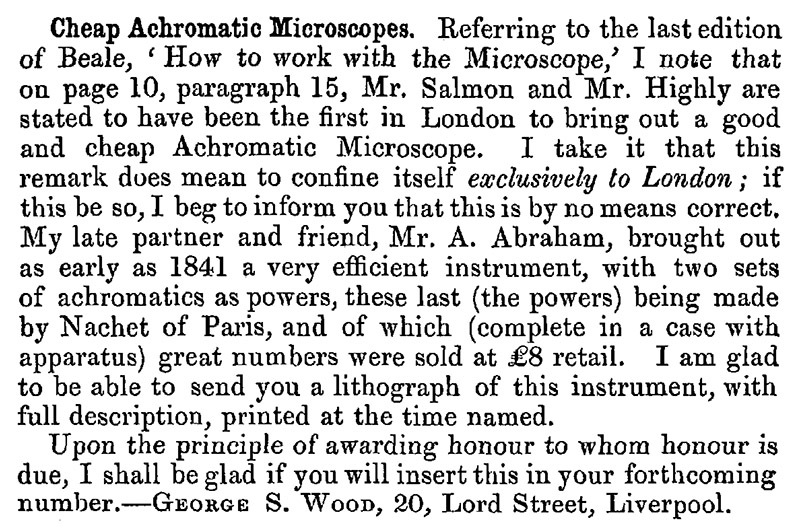 An 1868 letter from George Smart Wood to the ‘Quarterly Journal of Microscopy’, protesting that credit for early sales of achromatic microscopes by Abraham Abraham were being ignored by London microscopists. Figure 11. Telescope signed “A. Abraham, Liverpool”. Images adapted from an internet auction site for nonprofit, educational purposes. Figure 12. A monocular microscope signed “A. Abraham and Company”. Image adapted from an internet auction site for nonprofit, educational purposes. Figure 13. A binocular microscope signed “A. Abraham and Company”. Note that the instrument can rotate on its three-legged base. Image adapted from an internet auction site for nonprofit, educational purposes. Figure 14. An 1853 advertisement from Abraham and Co., Liverpool, stating that the business was established in 1817. 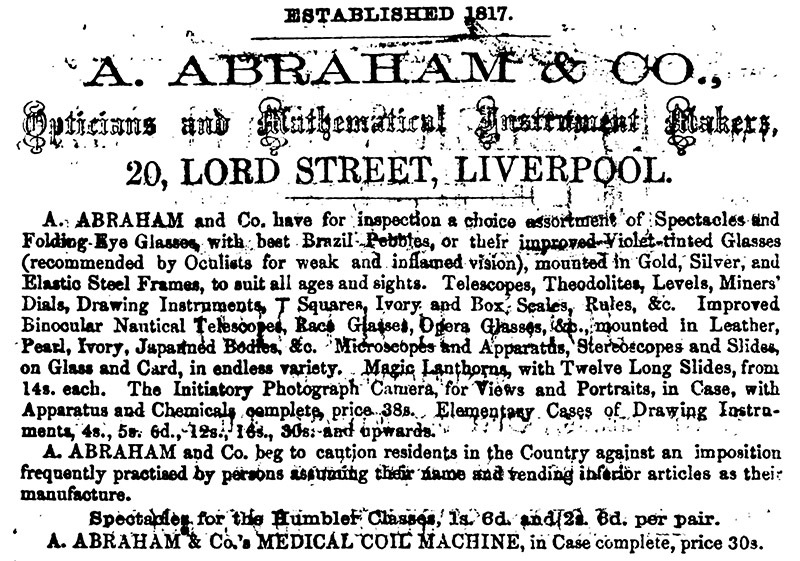 Abraham Abraham’s optical business was listed in an 1818 directory of Liverpool. According to later census records, Abraham Abraham was born ca. 1799 in Exeter, Devonshire. Some reports mistakenly give his birthplace as Bath, Somersetshire, that being the city where his family moved in 1800. Abraham’s father was Jacob Abraham (ca. 1770-1845), also a manufacturer of optical and scientific instruments. The Transactions of the Jewish Historical Society of England reports that “Jacob Abraham, optician and precision instrument maker, … came to 12 Kingsmead Street (Bath) from Fore Street Hill, Exeter”. Jacob was, therefore, likely to have been a son of Exeter silversmith and watchmaker Ezekiel ben Abraham (also known as Abraham Ezekiel, died 1799), and a brother of the noted engraver and printmaker Ezekiel Abraham Ezekiel (1757-1806). 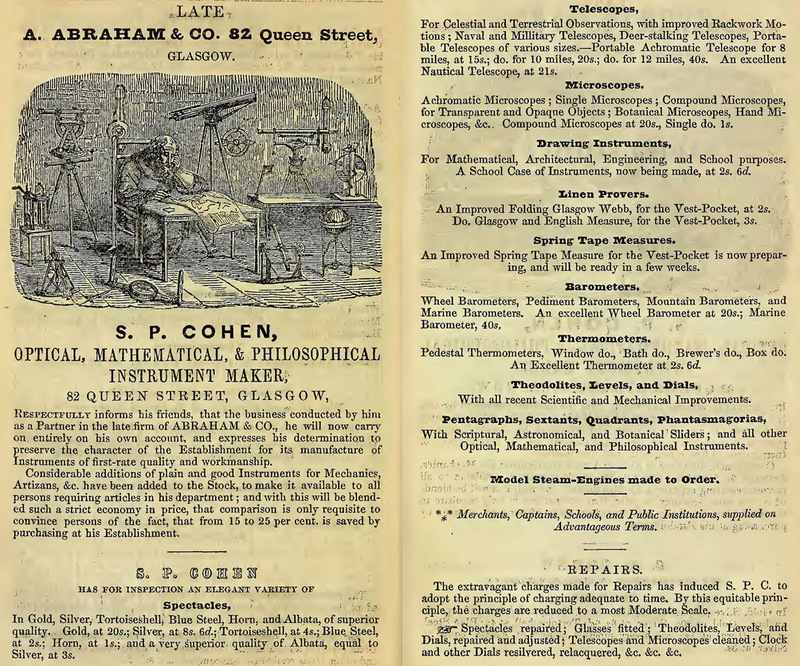 In 1838, Abraham formed a partnership with optician Simon Phineas Cohen, of Glasgow. Cohen was originally from Exeter, and so the two may have known each other through family connections. A.D. Morrison-Low reported that this partnership ended in 1843, with Cohen continuing the business in his own name. Cohen filed for bankruptcy in 1853, reportedly due, in large part, to debts owed to Abraham. Cohen and his family emigrated to the United States soon afterward: the 1860 U.S. federal census recorded the Cohens as living in Quincy, Illinois. Simon was then working as a “book keeper”. The 1870 census described him as a “fire insurance agent”. He died at the age of 89, in 1894. Figure 15. An 1838 Scottish advertisement from A. Abraham and Company. Image adapted for nonprofit, educational purposes. Figure 16. An 1840 Scottish advertisement from A. Abraham and Company. Image adapted for nonprofit, educational purposes. Figure 17. An 1844 advertisement from Simon P. Cohen, after the dissolution of his partnership with Abraham Abraham. Image adapted for nonprofit, educational purposes. Figure 18. An ivory and silver ruler that was made by Simon P. Cohen. Images adapted from an internet retail site for nonprofit, educational purposes. Abraham was involved with an 1839 exhibition of daguerreotype photographs and equipment, and may have sold such apparatus and produced photographs. That October, Liverpool newspapers announced, “Daguerreotype Exhibition - Pictures taken from nature, by Daguerreotype, manufactured under the superintendance of Mons. Daguerre, with a view of Paris from the Quai de la Megisserie, and the process of using this interesting Instrument. Exhibited daily from Eleven till four o'clock, at 58, Castle-street. Admission - One Shilling. Orders for the Daguerreotype received at the Exhibition, or by A. Abraham, Optician and Mathematical Instrument Maker, 20, Lord-street”. John Benjamin Dancer was originally from London, moving to Liverpool with his parents in 1818. He inherited his father’s optical and scientific instrument business in 1835. Dancer was also experimenting with daguerreotype photography in 1839. During 1841, Dancer and Abraham formed a partnership. A second shop was opened, in Manchester, which was managed by Dancer as “Abraham and Dancer”. Abraham continued to operate his shop in Liverpool, under his name only. The Abraham-Dancer partnership ended at the end of 1844, although it was not official until 1845: “Notice is hereby given, that the partnership heretofore subsisting between us the undersigned, as Opticians, at Manchester, in the county of Lancaster, under the firm of Abraham and Dancer, is dissolved, by mutual consent, as on the 31st day of December last. All debts due from or to the late partnership will be paid and received by the undersigned John Benjamin Dancer, by whom the business will hereafter be carried on. – Dated this 31st day of March, 1845, Abraham Abraham, John B. Dancer”. Details of Dancer’s life and career are available in numerous books and web sites, and so will not be discussed further, at this time. Figure 19. An 1842 advertisement from Abraham and Dancer, which was located in the back of William Sturgeon’s ‘Lectures on Electricity’. 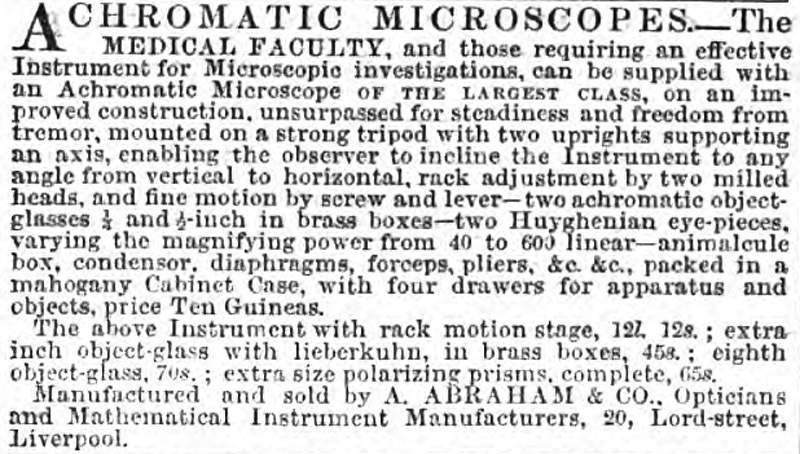 In addition to the large achromatic microscopes that Abraham had been advertising since approximately 1841 (see Figure 9), he introduced a portable instrument in 1845. 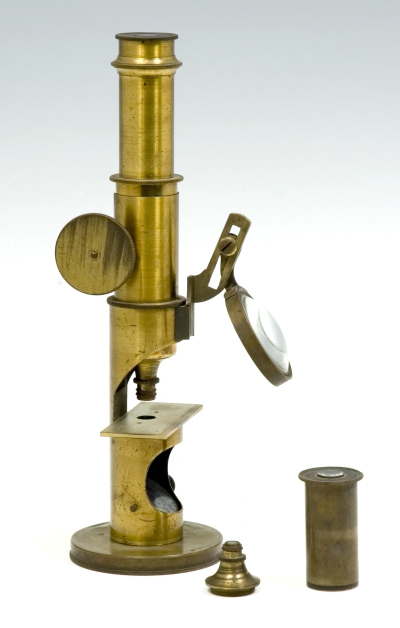 An advertisement read, “A new achromatic pocket compound microscope, for Physiological and Botanical Researches, with a Triplet Achromatic Object Glass; linear power, 200. Price, complete in a neat leather case, 3£ 15s. ; by post, 3£. 17s. 6d. 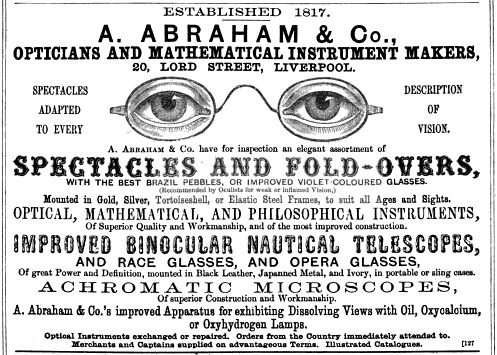 Manufactured and sold by A. Abraham, Optician, &c. 20, Lord-street, Liverpool. A very effective and extremely portable Instrument, peculiarly adapted for, and a desideratum to, the Medical Profession”. A surviving instrument matching that description has not yet been located. As noted in Figure 20, Abraham employed French achromatic lenses in his early microscopes. 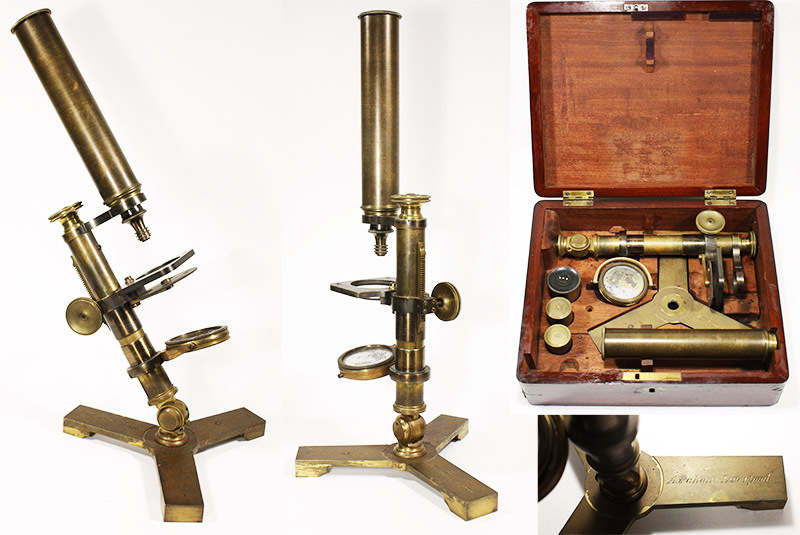 He was evidently close to Parisian instrument makers, since Georges Oberhaeuser announced in 1847 that he had developed a new form of microscope stand that had been suggested to him by “Mr. Abraham, of Liverpool” (Figure 19). Figure 20. 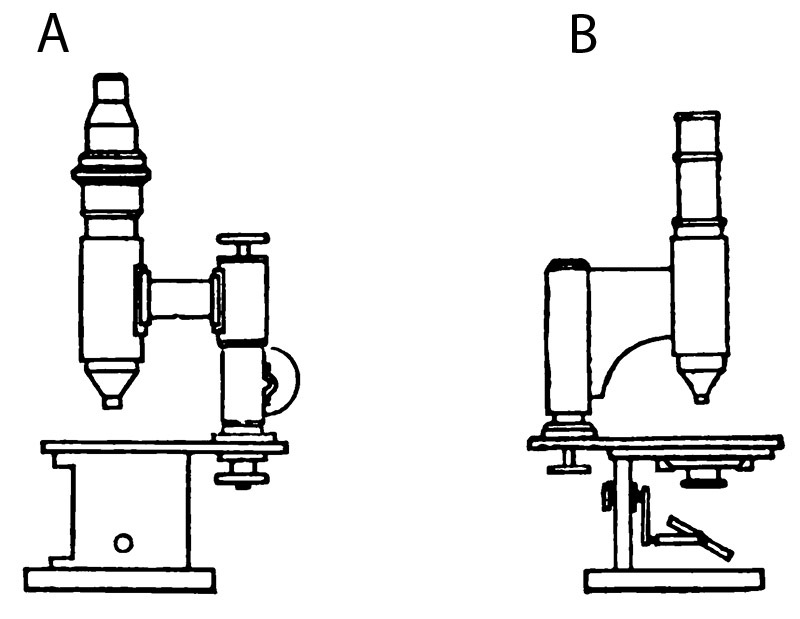 Figures from J.B. Nias’ 1893 paper “On the development of the continental form of microscope stand”. The base of the 1837 drum pattern of Camille Nachet (A), was opened up by Georges Oberhaeuser in 1847, in response to suggestions from Abraham Abraham (B). Figure 21. An advertisement from the November 3, 1849 issue of ‘The Athenaeum’. This is the earliest identified record of the Liverpool partnership of ‘A. Abraham & Co., opticians and mathematical instrument manfacturers’. A September 3, 1848 advertisement in the same magazine described the business as being operated by only A. Abraham. A Liverpool-based partnership was formed in the late 1840s, A. Abraham and Company. The earliest identified records of that firm are from late 1849 (Figure 20). Advertisements from 1848 described the business as being operated by only “A. Abraham, Optician &c.” This firm was located at 20 Lord Street, Liverpool, and remained at that location throughout the rest of the century. This partnership consisted of Abraham, Charles Joseph Harbertson West, and George Smart Wood. Charles West was born in early 1800, in the Holborn district of London. After the dissolution of the partnership, an 1857 advertisement from West stated that he had been “twenty-four years sole Manager to A. Abraham and Co.”. That implies that West began working for Abraham in 1833. The first English national census, conducted in 1841, backs up West’s assertion, since he and his family were recorded to be living on Lord Street (Abraham and his wife lived in a private home elsewhere). George Wood was also from London, born on October 21, 1816, in the Clerkenwell district. He was still in London at the time of the 1841 census, living with his parents and siblings. His father was a “carver”, and George was then working as a “machinist”. His eldest brother, Edward George Wood, later became a partner of the London scientific instrument firm of Horne, Thornthwaite, and Wood, and owner of his independent business of E.G. Wood. George’s relocation to Liverpool may have been motivated by his being the third son of the family, looking outward for new opportunities. Parish records of George’s 1844 marriage, which took place in London, described him as a “philosophical instrument maker” who lived on Harper Street, Liverpool. Quite likely, George’s wife was a romance from his London days, and the pair married after he had established himself in Liverpool. Wood is not recorded in any directories of the time, either as an optician or anything else, implying that he was an employee. Since he later formed a partnership with Abraham, and West emphasized that he had been “sole Manager” to Abraham, it may be that Wood worked for Abraham prior to the 1849 partnership. An advance on microscope substage illumination was promoted at that time, “The new Lenticular Achromatic Prism, invented by A.A. & Co., as a substitute for the mirror in examining lined or test objects, combining the advantages of the Achromatic Condensor with a more intense illumination than obtained by the usual concave mirror. Adapted to any instrument. Price, mounted complete, 1£, 10s”. Many papers on microscopical investigations over the next several decades mentioned the use of Abraham’s prism. 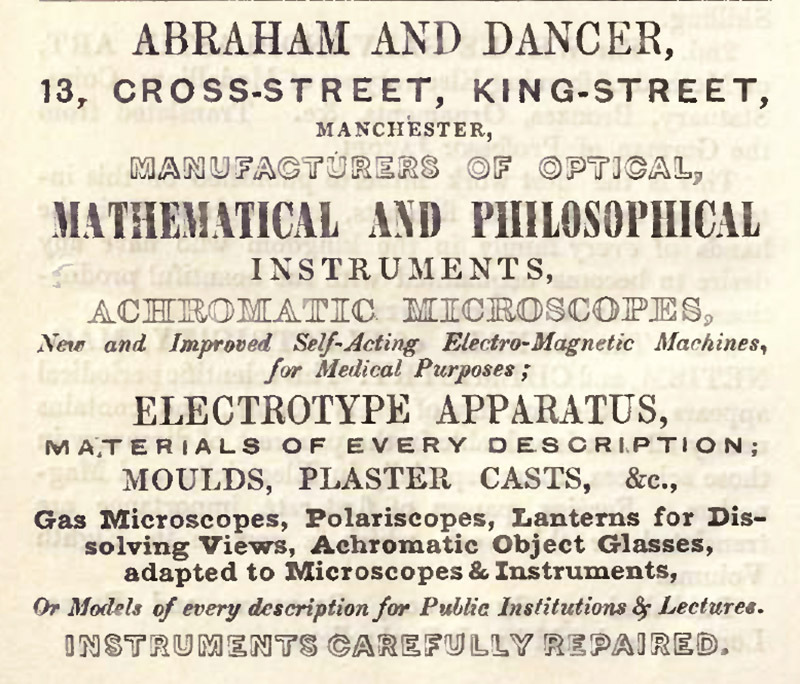 In addition to their microscopes, Abraham & Co. frequently advertised their “Beechey’s prismatic, trinoptric, and dioptric dissolving lanterns”, designed by St. Vincent Beechey but patented by Abraham. They described these as, “capable of throwing one, two, or three discs, of 20 feet each, on the screen, perfectly white, flat, and defined to the extreme edge … Its capabilities for producing Dissolving Views, Dioramic effects, long Geological Sections, or other views, 30 or 40 feet in length, or any of the numerous results of the combinations of three separate pictures, producible at once and entirely under the control of the Lecturer, cannot be equalled. To be had only of the Patentees”. These instruments, and others, were exhibited at the 1851 London International Exhibition. From the Exhibition’s catalogue, “Abraham, Abraham & Co., 20 Lord Street, Liverpool – Manufacturers. Trinoptric prismatic lantern, with apparatus for making oxygen gas. viz. : gas bag, retort, and purifier, invented by the Rev. St. Vincent Beechy. It combines the powers of three lanterns, with one small lamp of intense brightness. A disc of 25 feet for each tube may be obtained, and each disc is capable of being darkened to any required extent, without shadow on any portion of the picture. Dioptric prismatic lantern, producing two in lieu of three discs. Compound microscope, exhibited for workmanship. Portable sketching camera obscura. In the optical arrangement, a meniscus and prism are employed in lieu of a lens and mirror, and a vivid flat picture is obtained”. The finances of the Abraham & Co. partnership are not known, but they appear to have put Wood and West in charge of daily business, while Abraham retired from active involvement. The 1851 census places Abraham and his wife, Sarah, in the Wolcot district of Bath, Somersetshire. The Abraham’s did not have any children, hence his willingness to let his business go outside the family. The other partners’ finances were such that they also lived away from the Lord Street shop, West in the Mount Pleasant district, and Wood in West Derby. Both of those homes employed a domestic servant. The manners in which West and Wood described themselves for the 1851 census-takers say much about how each man viewed his role in the company: West declared himself to be a “shopkeeper optician”, while Wood was an “optician master, employing 9 men”. The partnership ended at the close of 1855, and was officially dissolved in 1856. From the London Gazette, “Notice is hereby given, that the Partnership heretofore subsisting between us the undersigned, Abraham Abraham, Charles Joseph Harbertson West, and George Smart Wood, carrying on business at Liverpool, in the county of Lancaster, as Opticians, under the style or firm of Abraham and Co., was dissolved by mutual consent on the 31st day of December last. All debts owing to and by the said firm will be received and paid by the said Abraham Abraham – Dated this 16th day of January, 1856. Abraham Abraham, Charles J. H. West, George S. Wood”. Abraham Abraham moved to Hampstead, outside London. He and wife Sarah evidently lived a comfortable life: the 1861 census showed that they had a cook and a housemaid, and Abraham left an estate of just under £12000 upon his death. In addition to his business as an optician and instrument-maker, Abraham was deeply involved with his Jewish congregations. Some biographies do not even mention his instrument work, but instead call him a professional author, due to his many published translations. His entry in the Jewish Encyclopedia reads, “English author and communal worker; died March 31, 1863, at Liverpool. He resided at Liverpool for forty years, during thirty of which he took a leading part in the Jewish affairs of that city; holding various honorary offices in the synagogue, the presidency of the Philanthropic Institution, as well as of the Jewish school. Though actively engaged in commerce, he found leisure for scientific and literary studies. Abraham is chiefly noteworthy for his efforts toward the introduction of regular vernacular sermons in the synagogue services of England. Through his exertions pulpit instruction was established in 1827 at Liverpool, whence it extended to the provincial synagogues. At a later date it was adopted in London. In 1827 a pulpit was erected in the synagogue at Liverpool. The innovation was hailed with derision, and not until Prof. D.M. Isaacs was formally installed in office was pulpit instruction successful. Abraham was the author of several publications designed to benefit the young. He translated, from the French, Cohen's ‘Catechisme’ and Ben Levi's ‘Matinées du Samedi’; the latter is known under the title of "Moral and Religious Tales for the Young of the Hebrew Faith". After the partnership breakup, Charles West opened a shop at 3 Paradise Street, described in advertisements as “bottom of Lord-street” and “one door from the corner”. 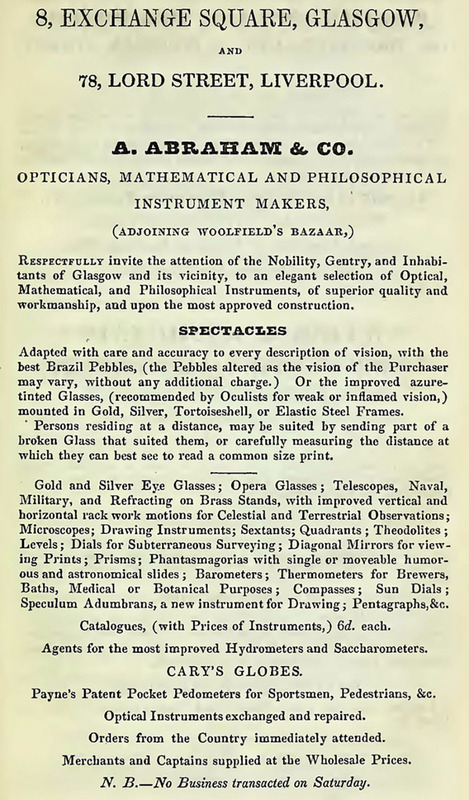 An 1857 advertisement stated that he sold “spectacles very carefully adapted to suit the most imperfect vision, mounted in Gold, Silver, and Steel”. Subsequent advertisements mentioned only eyeglasses, so it is not known if he continued to make and sell microscopes and other scientific equipment. West moved from Paradise Street to 52 Great Charlotte Street during the late autumn of 1867. Charles and his wife, Sophia, did not have any children. Sophia died in mid-1856, and he remarried the next summer, to Catherine Webber. The 1861 census recorded the couple living as boarders at 77 Vine Street, Liverpool. William died on March 18, 1868, leaving an estate of “under £800”. George Wood retained the shop at 20 Lord Street, and appears to have also kept the name “A. Abraham and Co.”. Advertisements have been located from 1858 onward in which that name was used (for example, Figure 23). 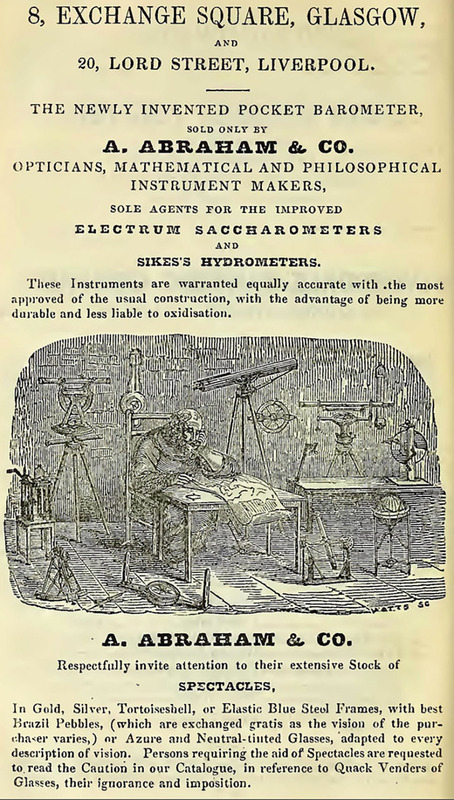 He continued to produce and sell a wide variety of optical and scientific instruments. His operation was evidently of a considerable size, the 1861 census listing Wood as “employing 10 men and 1 boy”. George, his wife, Susanna, and five of their children then lived in the Wavertree district of Liverpool, along with a domestic servant and a nursemaid. A branch shop was opened at 15 London Road, Liverpool, around 1870. The 1871 census listed two of George’s sons, 23 year-old William and 21 year-old John James, as “opticians” and living with their parents, so one or both may have operated the London Road shop. Both William and John joined the Literary and Philosophical Society of Liverpool in November, 1870, further suggesting that they were then getting acquainted with the local scientific community, a shrewd business move. Father George had been a member since 1863. About the mid-1870s, Wood appears to have changed the name of his business. In 1876, W.H. 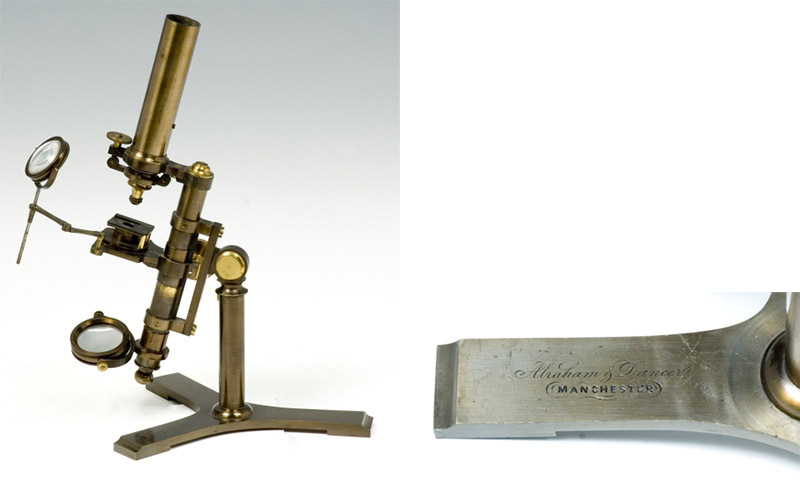 Dallinger presented on a device for centering microscope components (i.e., aligning the optical path), which he said was “beautifully manufactured by Mr. George S. Wood, optician (successor to A. Abraham & Co.), Lord-street, Liverpool”. The 1880 Kelly’s Directory of Liverpool listed the business as “Wood, George S. (late Abraham & Co.)” (Figures 24 and 25). But, the name evidently reverted back to “Abraham and Co.” shortly afterwards. William Wood’s entry has not been located in the 1881 census, suggesting that he had left Liverpool by that time. Perhaps not coincidentally, the London Road branch was closed by 1880. Both George and John were still in Liverpool in 1881, John now married and living in the Litherland district. The membership rolls of the Liverpool Literary and Philosophical Society for that year listed both men’s contact address as “Messrs. Abraham & Co., 20, Lord-street”. George Smart Wood died July 2, 1882, at home. Executors of his will were son John, widow Susanna, and unmarried daughter Caroline. He left an estate of just under £7000. John evidently inherited the optical business: his name, alone, is associated with it for the next several decades. Various address records suggests that he also inherited his parent’s house in Wavertree. In roughly 1900, John adopted the name “Wood-Abraham” for his business. Approximately the same time, a branch was opened in Manchester, at 24 Market Street. 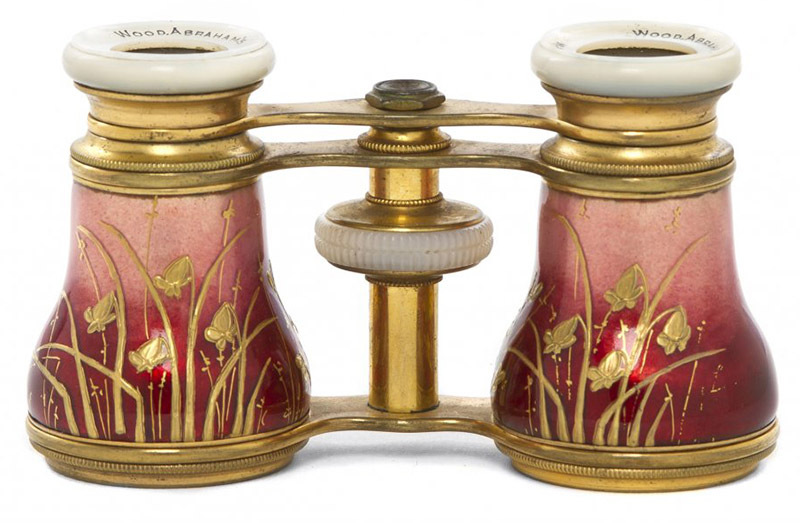 The major product of the business appears to have been eyeglasses, although other items are occasionally seen in auctions, especially binoculars (e.g. Figure 27). Period photographs of Lord Street and Market Street show both shops, under prominent, white eyeglass signs (Figure 28 and 29). John Wood died on January 12, 1918. A Richard Thomas acquired the Manchester branch by about 1910. He liquidated the Manchester Wood-Abraham in August, 1941. The ultimate fate of the Liverpool branch has not yet been determined. Figure 22. A "Martin" drum-style compound microscope, signed by Charles West. Sold between the date of the Abraham and Co. breakup (1856) and West’s death (1868). 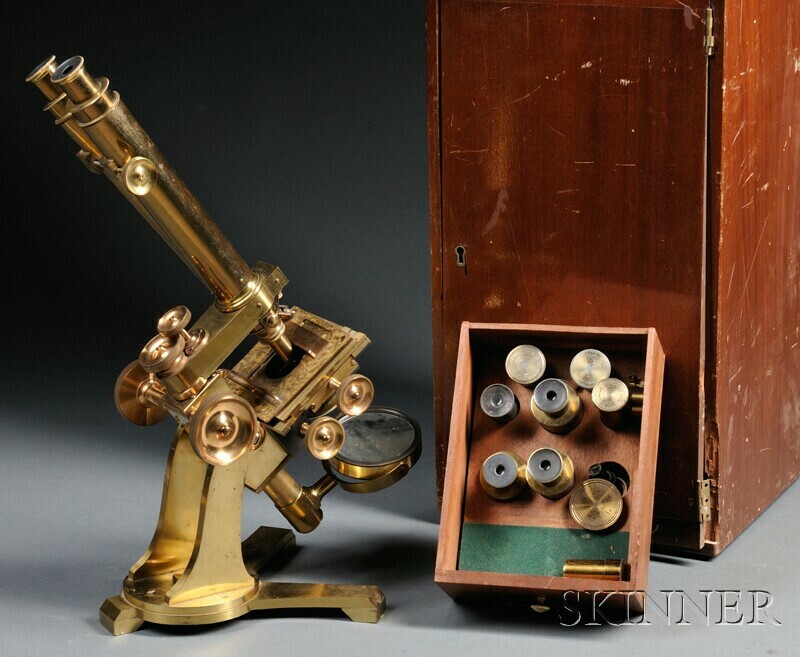 It is identical to many other microscopes of the time, and was probably produced by a London wholesale manufacturer, then signed by the seller. Images adapted from an internet auction site for nonprofit, educational purposes. Figure 23. An 1861 advertisement from A. Abraham and Co., when it was wholly-owned by George Wood. He sold a wide variety of optical, scientific, and engineering items. Figure 24. 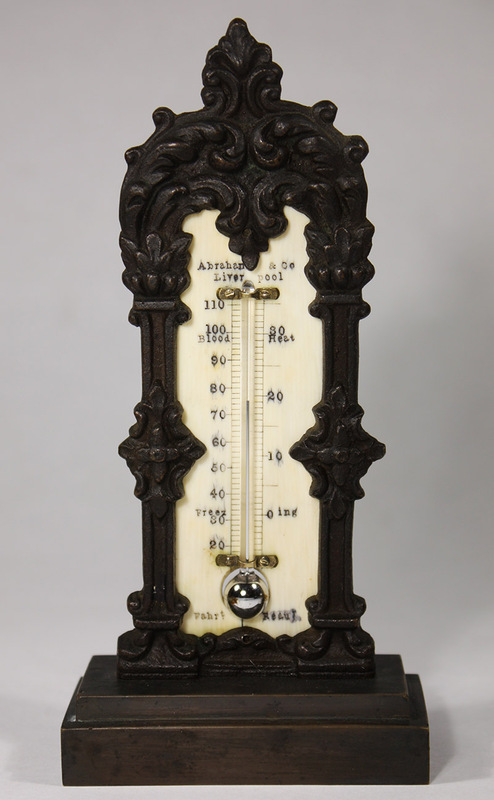 A thermometer from A. Abraham and Co., mounted on an ivory background with cast brass frame. Approximately 6 inches / 15 cm tall. Figure 25. 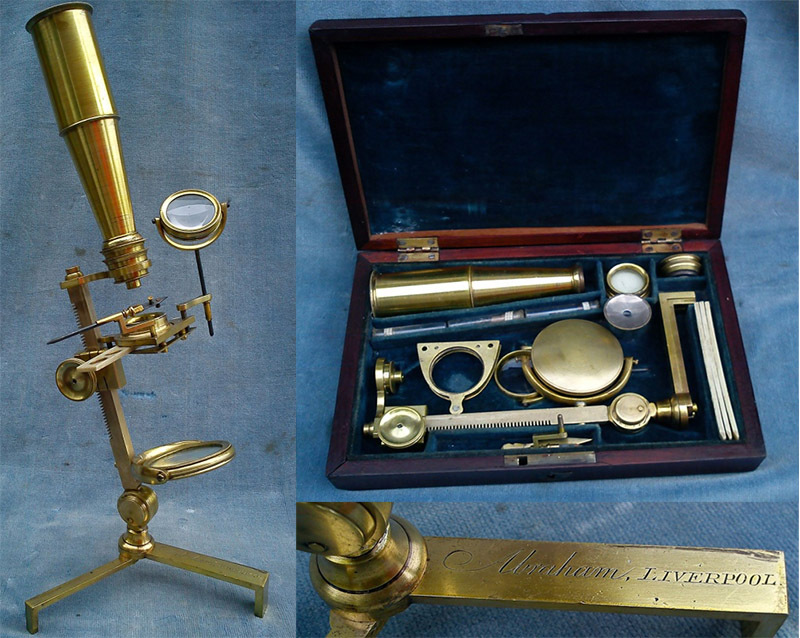 A microscope signed “Wood late Abraham & Co. Optician Liverpool”. Images courtesy of Steve Hodson. Figure 26. A microscope lamp signed “Wood late Abraham, Liverpool”. Images adapted from an internet auction site for nonprofit, educational purposes. Figure 27. A thermometer signed “G.S. Wood late Abraham & Co. Liverpool”. Images adapted from http://www.lecompendium.com/dossier_meca_33_galactometre/galactometre.htm for nonprofit, educational purposes. Figure 28. Opera glasses marked “Wood Abraham” on the eyepieces. Image adapted from an internet auction site, for nonprofit, educational purposes. Figure 29. 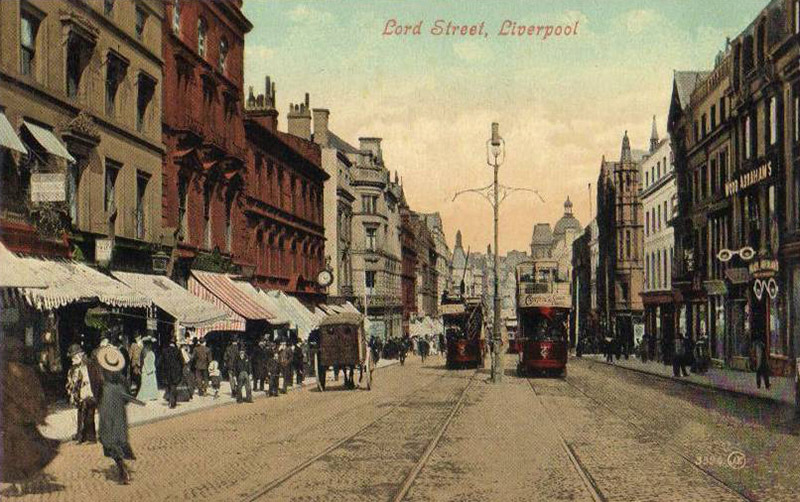 A circa 1905 photograph of Lord Street, Liverpool. Wood-Abraham, at number 20, can be seen at the right, with the prominent white eyeglass signs. Figure 30. An early 1900s photograph of Market Street, Manchester. Wood-Abraham, at number 24, is on the left, at middle distance. Many thanks to Allan Wissner, Steve Hodson, and others for generously sharing pictures and information. Post Office Directory of Glasgow (1838) Advertisement from Abraham and Co.